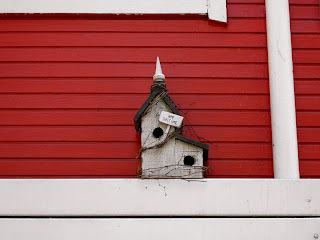 This two-flat-birds-apartment house can be found over one of the entrances to the red boat. Take care of the little ones I say. Them birds can eat. I bought a new feeder yesterday. Looks adorable but I'm not sure the "target group" would agree. If it's really a case of two separate adjacent flats I guess it'd have to be a real shortage on the real estate market before couple #2 moves in. If couple #1 allow them to, that is.